Whether you live in a joint family or simply with your better half, carpets are undoubtedly an interior accessory that does not fade for generations to come! Most people believe that carpets add a touch of comfort to floorings. Comfortable to relax on and safe for children to play around, carpets serve as an elegant cover for all types of flooring. However, as far as carpets are concerned, there are many different options to choose from; be it embroidery, velvet work, or plush carpet work, there are a range of options one can opt for. However, as costly as the purchase of a carpet may be, maintenance can be made easy with a little caution and pro-activeness. Like your body needs a check on a routinely basis to maintain your health, carpets too need to be inspected regularly. Thorough sweeping and vacuuming to remove the surface dust particles that may have accumulated on furniture and carpets are the right approaches to keep your flooring clean at all times. Just as carpets come in different styles and designs, each require a different mode of cleaning. Thus, ask yourself questions like, “Does your carpet need dry cleaning, carpet shampooing, carbonated cleaning or steam cleaning?” or “Is it soil and stain resistant?”. Be aware of the warranty period and other details before opting for any extreme cleaning measure. Carpets should be secured from excessive dust and other external particles when in danger of getting ruined at events such as parties. 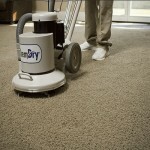 In order to thoroughly clean your prized carpets, you must not shy away from adjusting furniture to reach tough spots. As soon as you notice a stain on your carpet, get to work. The quickest action can produce the best results. Start with a lighter cleaning technique, preferably with cold water, and avoid chemical treatments. Dab stains with a cleaning solution and a clean cloth, a sponge, or paper towels. Blotting allows the stain to be soaked up in the cloth while rubbing causes particles to be absorbed in the carpet. Blot from the outside of the stain inward, as blotting outward can spread the stain. Many individuals prefer to use different stain removal methods for different types of stains. However, for those wondering the best cleaning methods for the most common types of spills, here’s a quick guideline: club soda for drink spills, shaving cream for general stains, and ice cubes for sticky foods such as gum. Have carpets professionally cleaned at least once every twelve to eighteen months, more often for high-use areas. We, at Advanced Surface Solutions, provide unparalleled carpet cleaning services in Arizona to not only make your carpet floorings look brand new, but also increase its life. Moreover, after getting in contact with a professional, ask as many questions about your carpet needs as possible. Ensure these professionals do not just give superficial treatment to your carpeted flooring and instead perform deep cleaning. In addition, ensure that the cleaning and stain removing method used is tailored to your specific carpet. Provide feedback to the professional service used and, in case you incur any problem or dissatisfaction, be sure to complain. With professional surface cleaning companies such as us, at Advanced Surface Solutions, providing a certified and hassle free service, there might be no need to look elsewhere if you reside in Arizona.